1993 Black Leopard Mare, deceased. Owned at the time of her death by Cheri’ Smith, Titusville, Florida. 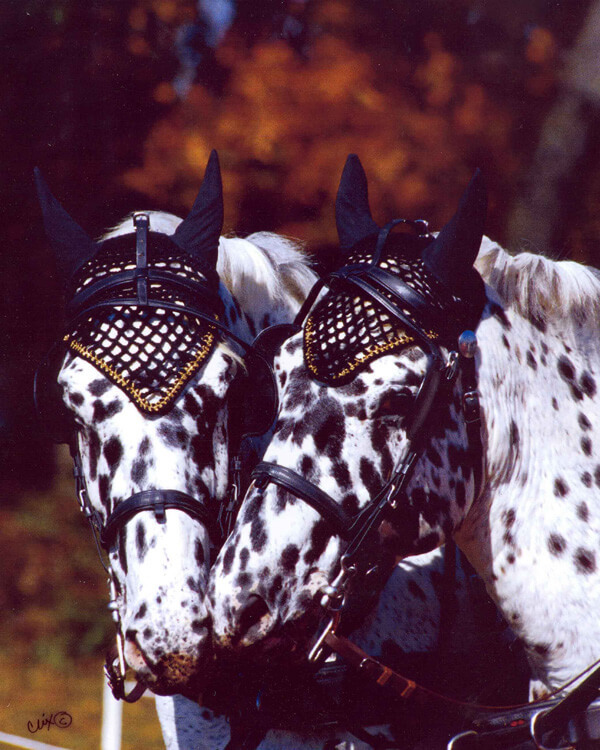 This eye-catching black leopard mare made the first perfectly matched pair of Stonewall Sporthorses, a bookend to her sister Blanche, foaled the previous year. This created a great deal of excitement at Stonewall Stud, as breeder Michael Muir’s driving career began in earnest. Like her sister, Stella took to harness with aplomb, and the young pair began competing in the demanding sport of combined driving, doing the double duty of carrying their first foals. Tragedy struck the following year when Stella suffered a terrible dystocia, losing her filly foal in a birth that resulted in a broken pelvis, and nerve damage so severe that quadriplegia was the result. Stella was down, utterly unable to rise with four legs left with little function. The attending veterinarians advised euthanasia, considering the prognosis hopeless. Michael resisted, because the mare continued to eat, her eyes were bright…he believed she wanted to live. The outlook became more grim as the sun was setting on the second day of Stella down. Horses just don’t survive this long, unable to rise. The veterinarians intervened, pleading to end Stella’s suffering. Michael begged for one last chance. A helicopter rescue sling was obtained. A chainsaw opened the barn loft floor above the stricken mare and heavy chains were hung from the rafters. The sling was positioned beside the mare and a mighty effort by six strong men rolled Stella into position. The chains on pulleys lifted her slowly into the air, suspending her lightly on her feet. Nothing short of a medical miracle ensued, astonishing the vets as each day Stella continued to live, a bit more weight placed on her feet, a little less support under her big body. Finally, Stella staggered an awkward few steps, dragging a hind leg. For days, we assisted her to rise, increasing her limited walking. Ultimately, Stella could get to her feet unaided, but her gait remained halting and awkward. She was alive, but to what end? Her doctors had no confidence she would recover completely. It took two years of rehabilitation to slowly restore her lost function. Against all odds, Stella stepped back in harness, the irregularities of gait diminished as her strength was restored. 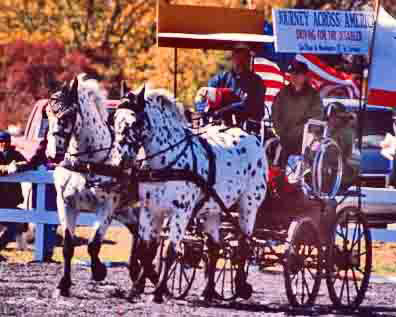 A testament to her astonishing courage, resilience and determination to live, Stella joined her sisters Blanche and Scarlett to lead the 2001 Horsedrawn Journey Across America, more the three thousand miles from California to Washington DC. Stella lived a dozen years more. There never was a braver mare.